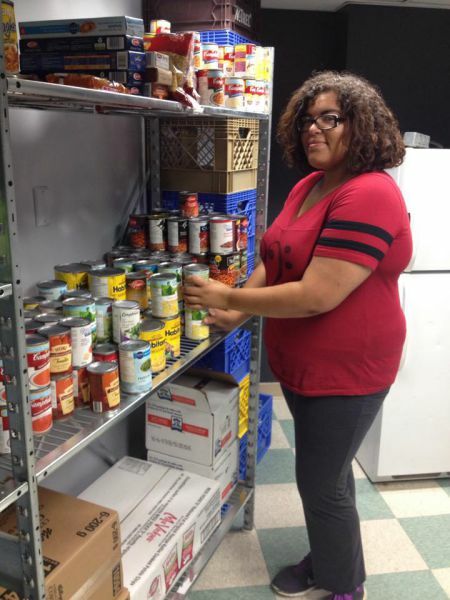 KJIPUKTUK (Halifax) -- The opening of a new campus food bank at Saint Mary’s University in Halifax is shining light on the troublesome trend of student food bank usage on Canadian universities. This is not a new phenomenon. In fact, students have been accessing food banks on Nova Scotia campuses for over a decade now. According to the Canadian Federation of Students-Nova Scotia, tuition fees for full-time undergraduate students in Nova Scotia average $6,440. The typical undergraduate student in Nova Scotia graduates with $37,000 in student debt. The price of post-secondary education leaves little money left over for essentials such as food and many worry that some students are going without. Feed Nova Scotia, a non-profit organization that delivers food to community and campus food banks, offers support to five university and college food banks in Nova Scotia. In 2014, Feed Nova Scotia delivered an estimated total of 21,400 kilograms of food with an estimated value of $118,000 to post-secondary students. Feed Nova Scotia typically delivers large shipments of food to campus food banks, which are run by students’ unions and volunteers working for students’ unions. Recent articles on food bank usage have identified international students, who are charged extremely high differential fees to study in Canada, as frequenters of campus food banks. Karen Theriault, director of development and communications with FEED-NS, explains that there is no typical user of a food bank. “We see people who are in all kinds of circumstances, whether they’ve been in a chronic long term situation around poverty, or people who have experienced a sudden health crisis, or a loss of employment, or in the case of students maybe increased financial burdens during a period of time,” says Theriault. Food insecurity is defined as individuals having limited access to nutritious foods due to a lack of money or resources. Another factor which can lead to student food insecurity is the distance to a grocery store. While there are bus routes available there are limited options for purchasing food on campuses. “To take an hour out of your day that you could spend studying to go get food is a problem. Around midterms and exams especially,” says Cvitovitch. Cvitovitch hopes that by teaming up with local food producers to bring a farmers market onto the Mount Saint Vincent campus, she will be able to provide fresh, nutritious, food at an affordable price, while eliminating the travel time to the grocery store. Final exam period is a stressful time of year for students, which is complicated by the fact that it occurs the end of the school year – a time when many students are running low on funds. “If a student is at university trying to learn and they’re burdened in the back of their mind with this worry about hunger or not having any food in the fridge or the money to buy the groceries, then they can’t really focus on their learning and realizing their potential,” says Theriault. It is not just students who are negatively affected by these trends, but also recent graduates who experience this burden. “The job market is becoming increasingly harder for recent graduates to enter and they’re accepting underemployment which is effecting their food security as well,” explains Cvitkovitch. According to the 2014 report 'Nova Scotia Vital Signs', the unemployment rate for individuals aged 18-24 in Nova Scotia is approximately twenty percent, accounting for the highest rates of unemployment for any age group in the province. Students are also effected by Nova Scotia’s unfair labour laws which allow employers to pay inexperienced workers - those who have been on the job for less than three months - fifty cents below the minimum wage for experienced workers. Many students shuffle jobs during the spring and summer months, taking summer jobs when they move home and then starting a new job again upon settling back into their studies. “We also have a lot of people [using food banks] who are employed. So they may have part-time jobs, or low paying jobs, sometimes two jobs at a time and still aren’t making enough to take care of their day to day needs,” says Theriault. A recent wave of initiatives on university campuses has led to a number of creative projects aimed at combating student food insecurity. These initiatives range from awareness campaigns, to providing prepared meals to students on campus. One such awareness campaign, Make Food Matter, was started by Mount Saint Vincent University nutrition students to create a public dialogue around food. “Make Food Matter gives people the opportunity to share their stories about why we need to make food a priority and talk about food issues such as food insecurity and producers not being able to make a living off of producing food,” says Cvitkovitch. By bringing people together to discuss, cook, and share ideas about combating food security, student and community organizations are also finding ways to create a stronger sense of community. The Loaded Ladle at Dalhousie University, for example, offers a number of services to students and community members including providing prepared meals. The Loaded Ladle is a non-profit cooperative that also provides healthy recipes, workshops, a food-based book club, and various other learning and bonding opportunities related to food. The Loaded Ladle will be running an extensive workshop series on food called 'To The Root' from October 15th-18th.